Well made. I like the Celtic pattern. I also like the smaller lettering so my dogs name and phone number can be more easily seen. 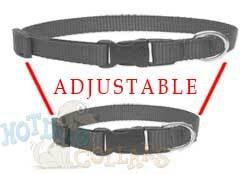 Other collars purchased have the lettering printed only once and too large and cannot be read as well. liked it so mich I bought 3 !! Having Basset Hounds , I woory about them getting out and losing them !! One of the problems is getting close enough to the Dog to read their tag !! Hot Dog Collars solved this problem by putting their Name and my cell number right on the collar !! Much easier for anyone to read , know their name and be able to call me in real time and let me know they have them or at least where they are !! I will always have a Hot Dog Collar on my Dogs !! We have gotten many compliments on the Celtic dog collar. It fits perfect and is very soft to the touch. No rough edges. My little guy has a basket of collars for all occasions and they all came from Hot Dog Collar! Recieved the collar very quickly and it looked better in person than even pictured... Great quality. Highly recommended..